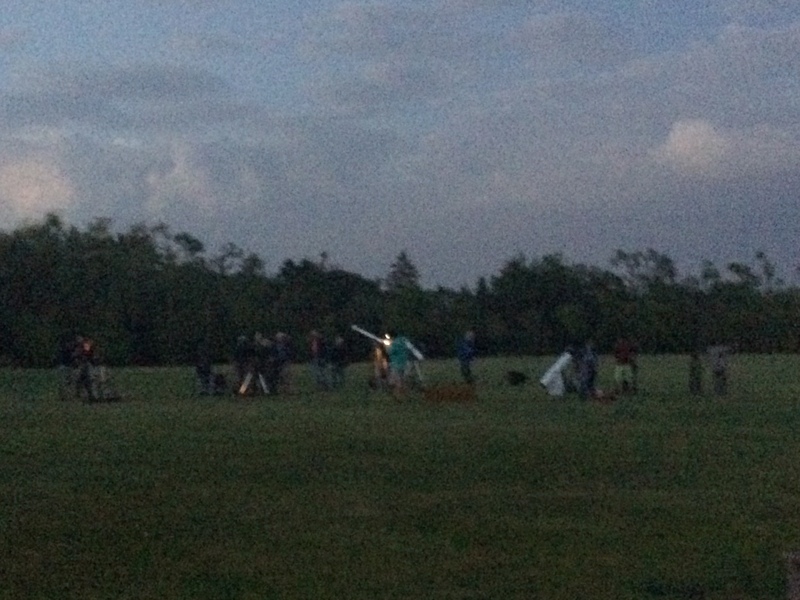 On Monday, June 9, 2014, the Royal Astronomical Society of Canada (RASC) hosted its monthly City Star Party. 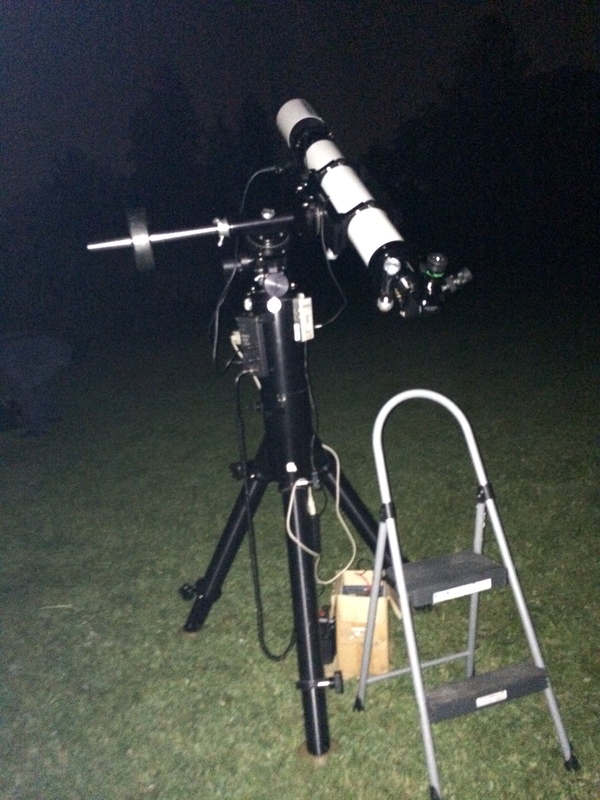 This star party took place at Bayview Village Park, where many RASC members came to view the Moon and the planets and any stars that were visible in the night sky. RASC Members setting up telescopes. I arrived at Bayview Village Park at 9 pm. By then, many RASC members and visitors were setting up their telescopes. There were a few Schmidt-Cassegrain telescopes, a couple of Newtonian telescopes, some Dobsonian telescopes, and a fair amount of refractor telescopes. 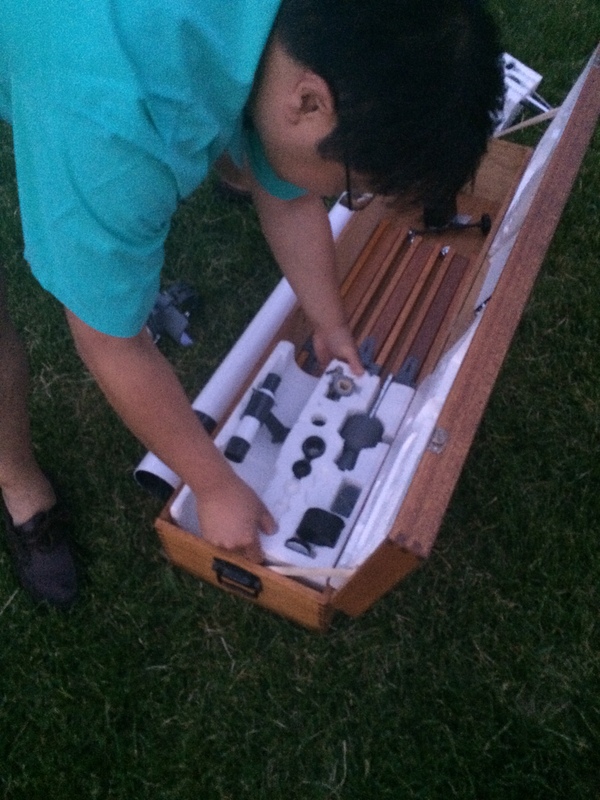 One member brought a refractor telescope that he restored using 60 year old optics handmade from Japan. It was quite amazing to see such an optic being used again after all these years. It was very interesting. A RASC Member setting up his newly restored telescope. Used with permission. When I was there, it was quite cloudy. So much so that it casted doubt as to whether the sky would clear. However, half-an-hour later, it cleared up very nicely. We were lucky that we were blessed with a clear night to view the planets. Once I saw that the sky has cleared, I decided to set up my telescope. It took a few minutes, but I got it up and running. While I was operating it, a few people came to my telescope and looked through it. I was able to answer any questions they had about astronomy and imaging the night sky. Doing that, I was also talking to a friend of mine, who also has an interest in Astronomy. I told her about the city star party. At the same time, the International Space Station (ISS) appeared streaking across the night sky. It was very beautiful but not as bright as when I was in Glen Major Park during the May 24th meteor shower. Since I had my telescope, I decided to slew and try to capture the ISS on my telescope. 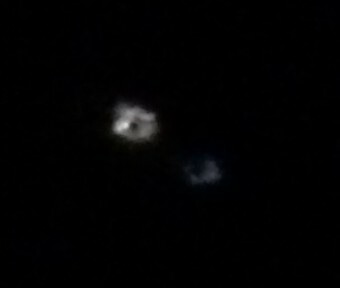 It took a while, but I was able to see the ISS on my telescope zipping by very quickly in the field of view of the scope. 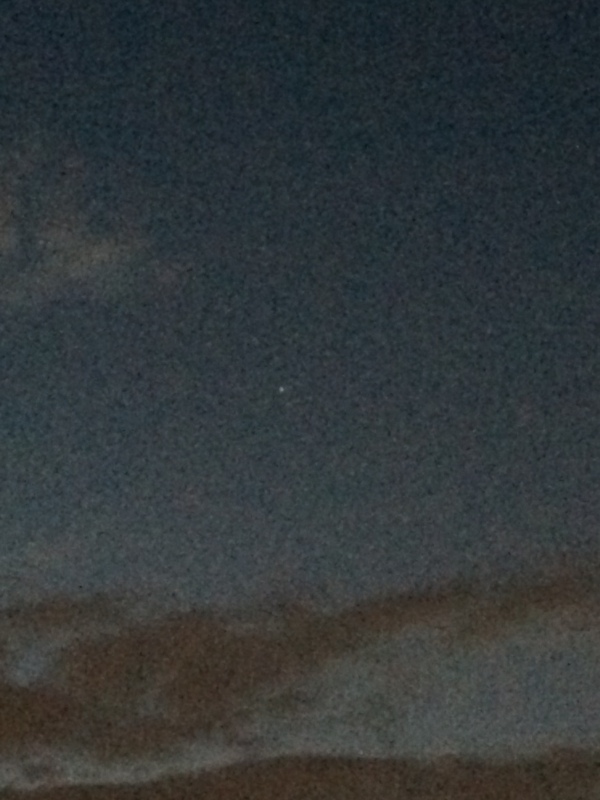 From what I saw, I felt like I would be able to make out the shape of the ISS from the telescope. Wouldn’t that be a sight! ISS flying through the sky. After viewing the ISS, I went on to view the planets and the Moon. I first slewed to Mars. Like all the other times I viewed Mars, the surface features weren’t clear to me. I then slewed to Saturn, and saw its majestic rings. A few people came to my telescope and checked out Saturn. They were awestruck by its beauty. I then returned to Mars, but I wanted to zoom closer to it. I borrowed a friend of mine’s 10 mm eyepiece, which will zoom in further towards the planet. However, I had a lot of trouble finding it. One issue I am experiencing is that my finderscope’s base is quite wobbly. It made it hard to find any celestial objects, because the finderscope wasn’t calibrated to my scope for long. I decided to slew back to the moon and calibrate my scope there. After doing that, I slewed back to Mars, and using my friend’s 10 mm eyepiece, I finally found Mars. It was slightly bigger, but no more detailed than before. 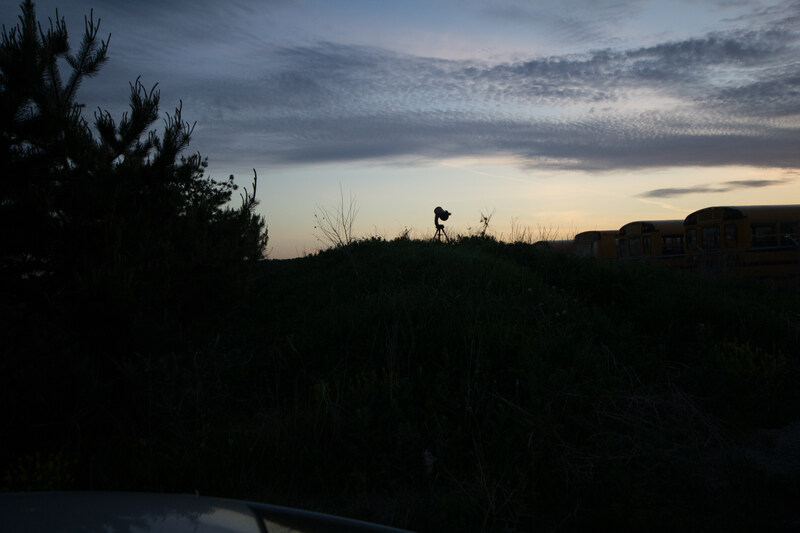 I soon returned his eyepiece, and continued to observe the night sky. 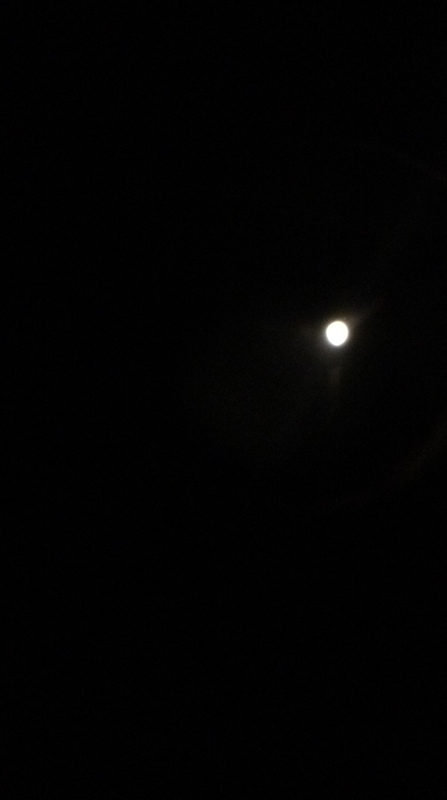 I then slewed to the Moon for another visitor, and a visitor was amazed by the beauty of the Moon. For the night, I felt like there was a lag on my telescope. I now know that there is a 1 second-long lag on my telescope. I suspect it is because of the Azimuth gear broke down again. It was confirmed by another RASC member, with the same type of scope, who recently joined RASC. As a result, after looking around a bit more, I decided to pack up my scope for the night. I brought all my equipment to the car, and made sure I didn’t leave anything behind. After I packed everything up, I came back to look at other people’s telescopes. I saw a variety of objects. I saw Jupiter through my friend’s restored refractor. It did a good job magnifying Jupiter. It was beautiful. RASC City Star Party underway. I then went to someone who had a circular telescope. It looked like a beaker. The owner told me it was an Astroscan telescope. Another RASC member came up and talked to the owner of the telescope. It was interesting to hear that this telescope was built in the 1970’s. Looking through it, when it was slewed to the Moon, it magnified it, but compared to my scope, the image was very small, but the quality was really good. I was impressed. I soon went to another RASC member’s Meade Schmidt-Cassegrain Telescope (SCT). He had attached a binocular adapter to his telescope. He let me look into it, and I saw Saturn, but with both my eyes. With most scopes, you need to close one eye to see through the telescope. However, with the binocular adapter, you can use both eyes to see the night sky. It was interesting to use both eyes to view an object. It might be something worth investing in the future. 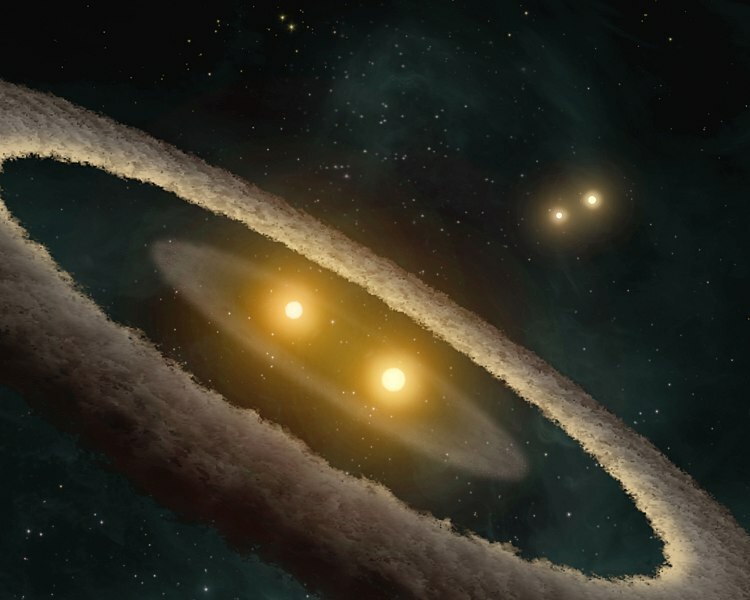 Artist depiction of HD 98800, a double star system. When I saw that, I was intrigued by it. It is the first double star system I saw. Hopefully I will see more, and try to image them in the near future. Two stars that have been defocused. The lighter coloured star is cooler than the blue star. It was very interesting to know that. This means I can look at the stars, and get a good idea of how hot a particular star is. Hopefully I can put it to good use. I then went to another member’s refractor telescope that was pointed to the ring nebula. I was excited to see the ring nebula in its beauty. Earlier in my hobby, one RASC member told me that we shouldn’t expect much from Deep Sky Objects when observing them visually. I finally understand why. What I saw was the Ring Nebula, but it was barely visible. I was able to see a grey indentation of the ring nebula behind a black sky, but nothing more. I suspect light pollution played a big part in blocking a large portion of this Messier object. Hopefully I get a chance to look at the ring nebula in darker skies. At that time, the ISS finished an orbit and came back up the night sky again, albeit at a lower elevation than before. It was really nice to see the ISS again. Unfortunately, I couldn’t image it again with my scope as it was packed away. Near the end of the night, I saw a RASC member with a CGEM EdgeHD Celestron Telescope. It is the top of the line telescope, with excellent optics to view the night sky with. I was able to learn about polar alignment with their mount. There is a recticle there which shows a circle with a smaller circle at the edge of the bigger circle. You put Polaris inside the smaller circle and you get a good approximation of where the North Celestial Pole is. It was interesting to see how polar alignment works in the CGEM Mount. They then slewed to Mars. I hoped they would slew to Mars to test whether their scope has better detail of Mars than my own scope. Unfortunately, it didn’t look much different than my own scope. Maybe it is because of the seeing, or multiple frames need to be stacked before getting any detail. Whatever the reason, Mars is tricky to see and image properly. Before Mars goes behind the sun, I hope I can get a good image of it. By midnight, many people left with only a few people still observing. I also decided to leave the party at that time, and head home. That Star Party had been a very interesting experience. I saw a lot of new and interesting celestial objects. I also learned a lot about telescopes, and how to use them better. I saw the ISS twice tonight, and I met a lot of new people. Hopefully, the sky for the Dark Sky Star Party is clear and the turnout is as much as the City Star party. Good night and happy observing! On June 1, 2014, it was predicted to be a clear night. It was also predicted, by my Clear Sky Chart app, that the planets would be aligned just right so that you could see four of the five visible planets in the evening sky. Mercury would be closest to setting, then Jupiter, then Mars, then Saturn. It would’ve made a nice image. Therefore I went to an elevated area to try and image it. I had to go through various weeds to get to the right location. However, contrary to the Clear Sky Chart app, there were clouds in the sky blocking my view. It was disheartening to see those clouds in the sky despite a prediction of a clear sky. I stayed a bit to see if the clouds would clear, fighting off mosquitoes at the same time. However, it became apparent to me that the sky wouldn’t clear in time. I then tried to take a few four-minute exposure images of the Moon to get a few moonshine images, however, those images turned out to be a bit unclear and unfocused. That trip turned out to be quite a waste. However, I didn’t want to call it a night yet. 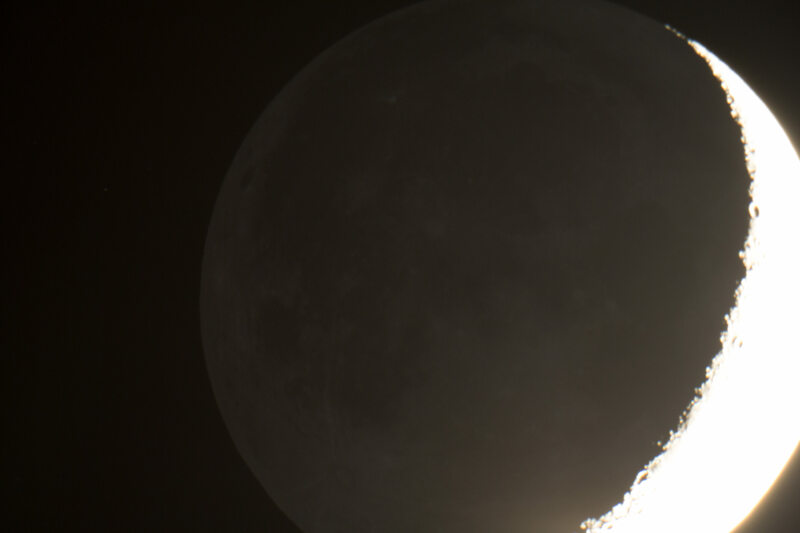 Earthshine visible on the Moon. After I got those photoes, I decided to finally call it a night. I brought all my equipment inside and got some rest. While I have been taking potentially great photoes, I have yet to co-add them and see the final result. In order to move forward, I need to find an effective way to co-add images, convert RAW image files to TIFF or JPG files, and produce phenomenal images. Once I can master that, then I can move forward. I hope I can do that one day. Until then, I will keep doing what I do. Wish me luck! 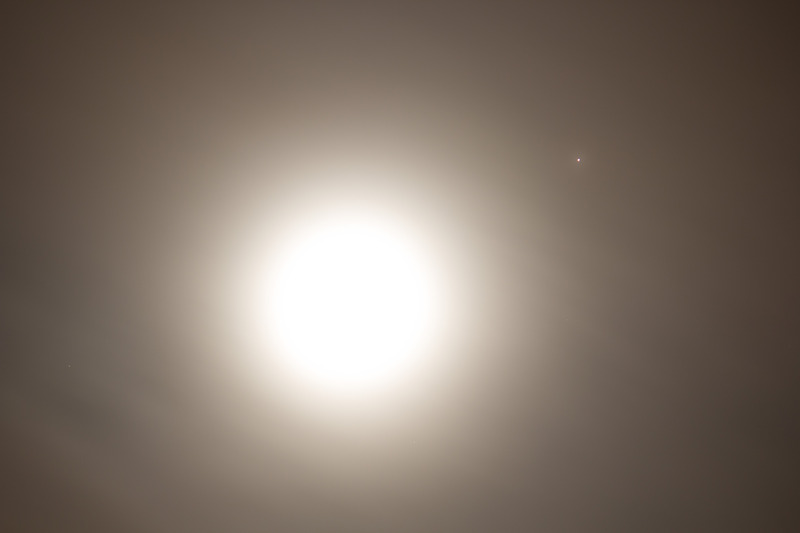 On June 7, 2014, Mars and the Moon were in conjunction with each other being only two degrees away from each other. According to my Clear Sky Charts app, it would be clear before 1 am, therefore I decided to quickly image the conjunction using a camera with a telephoto lens. Moon and Mars conjunction. They are two degrees apart from each other. The Moon. It was a split-second shot. The amount of light captured was enough to see the Moon only. Mars was too dim to be captured at that setting. I set myself up on the driveway, which meant that I attracted the attention of many onlookers driving through the neighbourhood. It was nice that people had an interest in what I was doing. However, one of the most notable moments was when my next door neighbours noticed me looking into my telescope. Two of my neighbours noticed what I was doing, and approached me. I told them about tonight’s conjunction of the Moon and Mars, and what I was doing to image it. I let them look into my telescope to see the Moon and Mars for themselves. They were quite surprised at what they saw. They asked me many questions, relating to imaging these celestial objects, the telescope quality and price, the effects of doing astronomy in the city, and other questions. It was a great conversation. 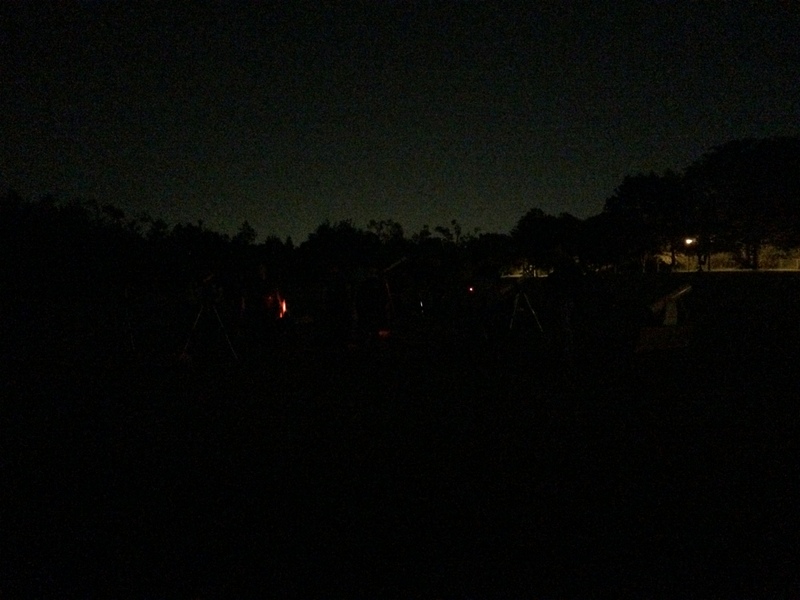 It felt good to show them what I do as an amateur astronomer. After a while, they went back inside. I continued to stay outside and image the sky. 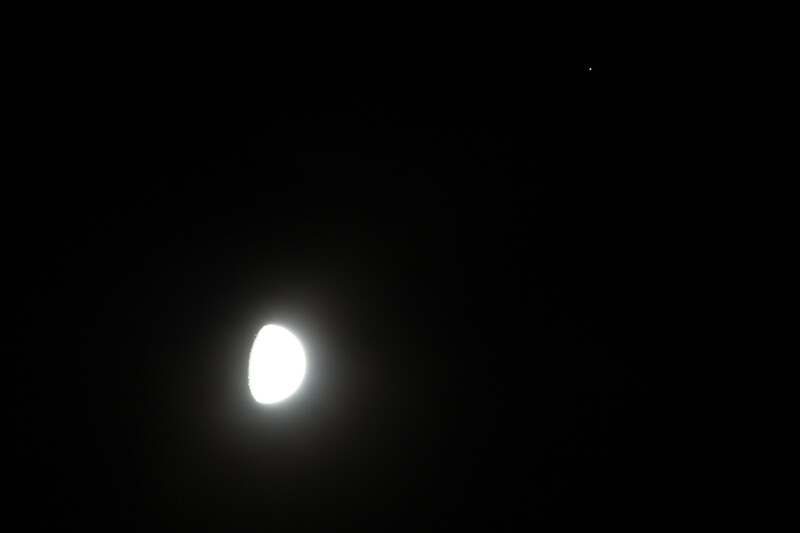 Mars and Moon conjunction. 30 second exposure. However, I didn’t stay out much longer. As the night went by the cloud cover become more intense, actually blocking my view of Mars. When I couldn’t see Mars anymore, that is when I decided to pack up and go back inside. It was a really good night. I saw the conjunction of two celestial objects and I showed what I do as an amateur astronomer to my neighbours. It felt good to do that. Hopefully, I can do it again the next clear night. 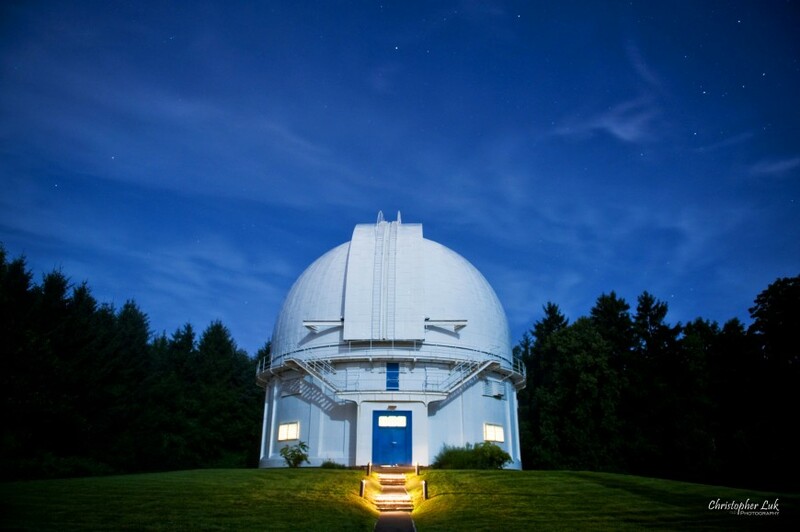 On Saturday, May 31, 2014, the David Dunlap Observatory (DDO) hosted a family night where families could come and tour the DDO, learn about astronomy, and have a great time. As a member of RASC, I went to this event as a volunteer. The event started at 9 pm. I was assigned to work at the DDO Big Dome with two other people. My assignment was to explain how the star finder worked, and what each image was on the wall. During the event, I was able to explain to visitors how the star finder worked, and talked to them about the exhibits that were on the observatory’s wall, and was able to answer any astronomy-related questions. One of the most fulfilling moments during my time there was when I talked to a guest and the group of kids about what’s the best scope to use, and answered questions about the planets, movement of the stars, and other questions. It felt good to help them get interested in astronomy. After the family night ended, the RASC members were invited to look at the planets with the big telescope. We saw Mars and Saturn using that scope. It was incredible to see planets on a telescope that has been used in a variety of research projects during its 79 year lifetime. Note that the images taken are not the same as when you actually look through it. After looking at the telescope, I decided to call it a night. Before I left, I looked at another RASC member’s telescope. It was a refactor with 330x zoom. 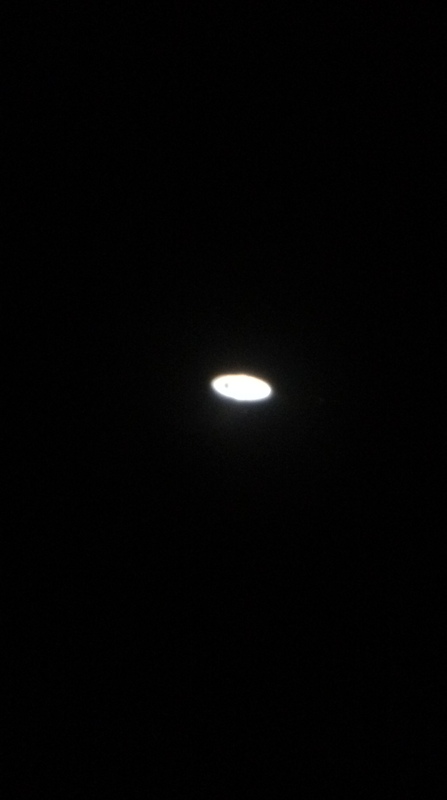 Looking at Saturn, it was so close compared to my telescope. I was astounded by the zoom of his telescope. It was a great night, but it’s not going to be the only Family Night that RASC will host. RASC will host another one on June 14, 2014. Hopefully, you will all be there. June 3: There will be a triple transit event on Jupiter from 18:05 – 19:44. It will be visible in Eastern Europe and Africa. June 7: The Moon and Mars will be in Conjunction. That means there will be two degrees of separation between them. The Moon will shine at magnitude -12.8, and Mars will shine at magnitude -0.8. They will be both visible until 6 hours after sunset. June 10: The Moon will occult Saturn at approximately 18:48. It will be visible in the Indian Ocean. June 13: The Moon reaches its full phase. June 21: The Earth reaches Summer Solstice at approximately 10:51. June 22: The ISS will be completely illuminated near the Summer Solstice. This means that the Northern Hemisphere will be best placed to view the ISS many times. 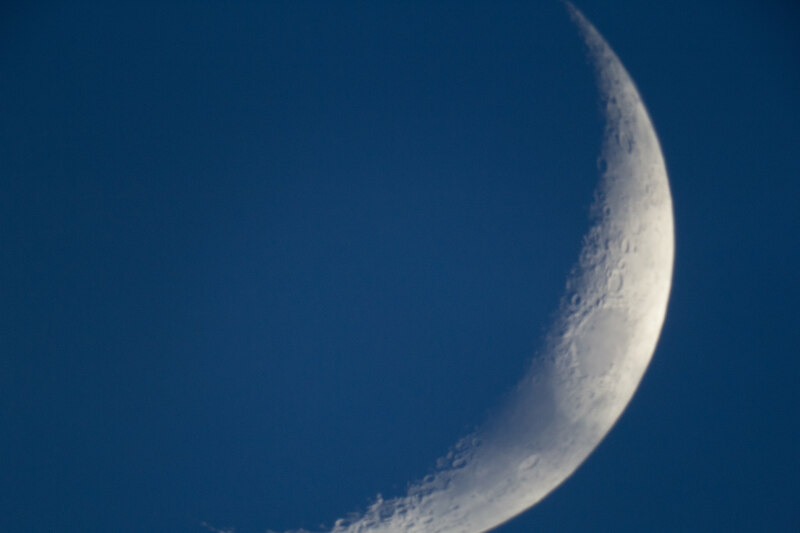 June 24: The waning crescent Moon will pass within a degree of Venus. Great time to spot Venus. 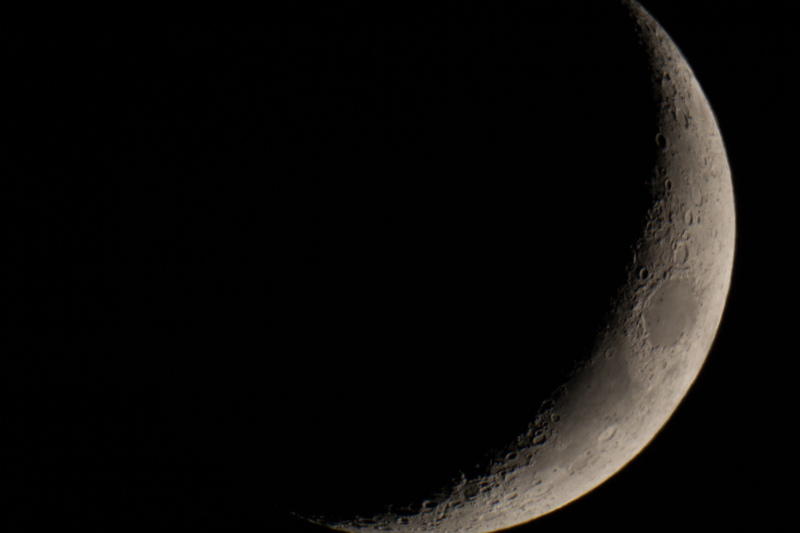 June 26: The Moon occults Mercury 20 hours before the New Moon. It’s visible in Southeast US and Venezuela just before sunrise. 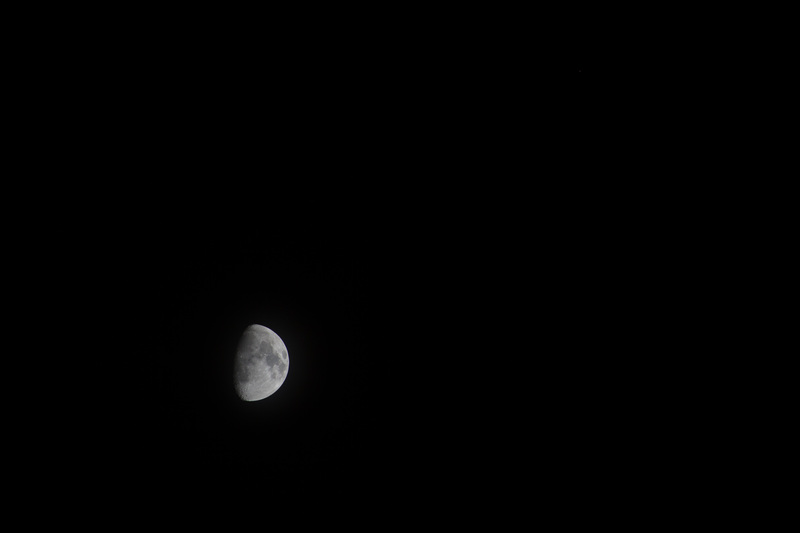 June 27; 20 hours later: The Moon reaches its new phase. June 27: The June Bootid Meteor Shower will peak at approximately 15:00. It will be most visible in the Central Pacific. June 9 – 12: There will be a City Star Party, where people can look at the stars and planets without going outside of Toronto. A telescope is not necessary to attend. This event is free for the public. It will be located at either Bayview Village Park or at High Park. Go to http://www.rascto.ca for the GO/NO GO call. June 14 and June 21: The David Dunlap Observatory (DDO) is hosting a family night for families to come and tour the observatory. It is a great way to start learning about astronomy. They require tickets to be purchased in advance. This event is not weather-dependent. However, children under 7 are not allowed in the Big Dome. Anyone can attend. It is $8.00 for a ticket. Go to http://rascto.ca/content/ddo-family-night-0 for more information. June 23: This is the window for RASC’s Dark Sky Party that will take place at the Long Sault Conservation Area. It will start at 8 pm. This event is free and open to the public. Telescope are not necessary to attend. Go to http://rascto.ca/content/dark-skies-observing-16 for the GO/NO GO calls. June 25: In shores of Strait of Juan de Fuca, in Victoria, BC, there will be RASC’s 54th annual General Assembly. It is a great educational event with great opportunities at meeting people. Go to http://www.rascto.ca for more information. Thank You!